Help Documents - Version 5 Event PreferencesHow do I include the registrant's Guest Count in the total registrant count? 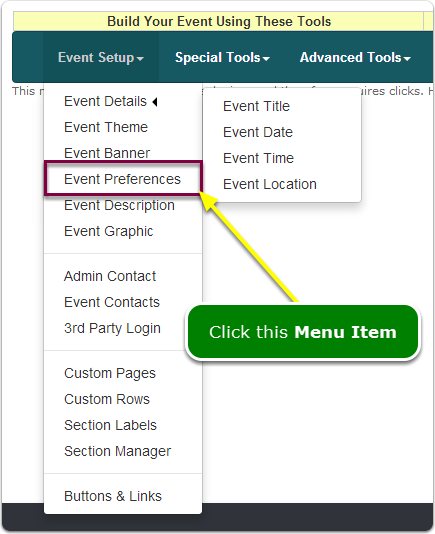 If you allow a registrant to bring a guest(s) AND you want to include each registrant's guest count in the total number attending your event, then turn on Guest Counting. Why is a guest count question created for me? Since questions can be linked to other questions conditionally, you can display other questions and sales items (tickets) for just the guests, such as meal tickets for guests, etc. How do I edit the number of guests that a registrant may bring? Return to this screen and change the number of guests allowed per registrant (see the step above). You cannot change this number in the Questionnaire Wizard. Prev: How do I allow duplicate email addresses? Next: How do I hide the Add New Registrant button?